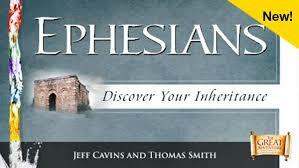 EPHESIANS – Discover Your Inheritance by Jeff Cavins reveals many remarkable gifts that we as Christians are given in the Church. This letter tells us about the nature of the Church – as a body, as a household, as a mystery, as a communion, as a bride, and as an army. It shows us the great inheritance that awaits us as sons and daughters, adopted fully into the family of God. It reveals how God’s great love for us can transform our daily lives if we allow it. Ephesians: Discover Your Inheritance is an 8-part Bible study that will enrich your faith and show you how to live it out. We hope you will be able to join Sr. Barbara Rund on Monday evenings (7:00-8:45 PM) or Thursday mornings (9:30-11:15 AM) in Parish Hall B. To register for Ephesians, please click here, or you may print a copy of the registration form (Monday evening, Thursday morning) and return to the Parish Office.